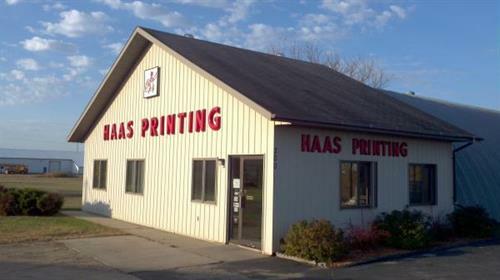 Welcome to Haas Printing, putting you first since 1967! Family owned and operated, Haas Printing is your experienced source for one to full color printing, coping, design, mailing and shipping services. Haas Printing is here to serve you with over 50 years in the printing industry. Products include; Brochures, Fliers, Business Cards, Envelopes, Letterheads, Invoices, Booklets, Sell Sheets, Rack Cards, Rate Sheets, Newsletters, Post Cards, Invitations, Posters, Banners and More..
Services include; Typesetting, Design, Printing, Black & White Copies, Cutting, Folding, Addressing, Bulk Mailing, FedEx Shipping, Color Copies, Print, Scan, Email, Fax, Free WiFi, and More. You can count on us for your printing needs. Located South of Park Rapids, West of Hwy. 71, in the Industrial Park.